What is your favorite side dish during those scrumptious holiday months? 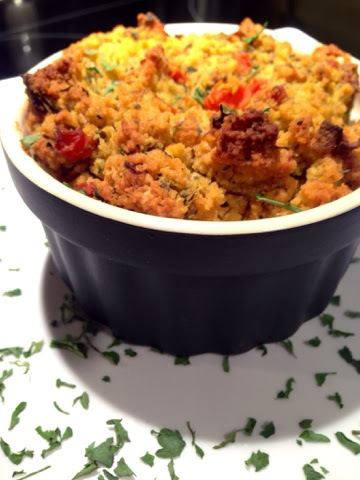 Some people enjoy green bean casserole, some the cranberry sauce, but for me and many others, the best part of the whole meal is the stuffing. 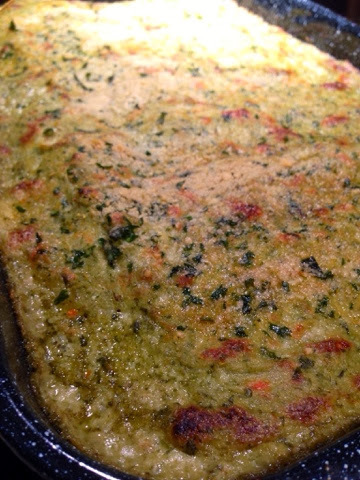 A true indulgent of yummy carbs, mixed with savory herbs and sometime fruits and nuts. 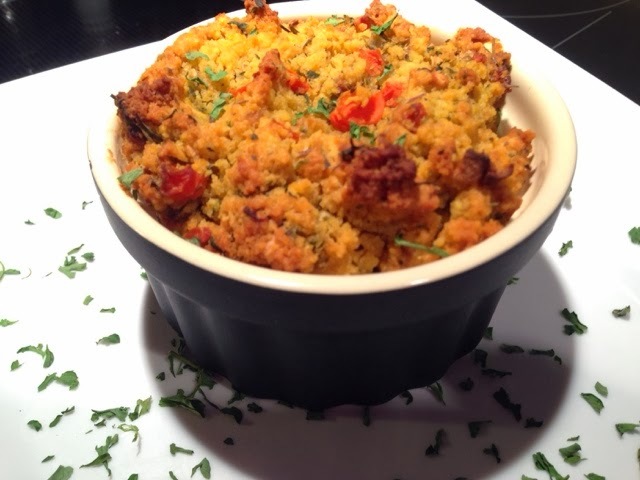 This recipe shows you how to make a easy and completely comforting stuffing. 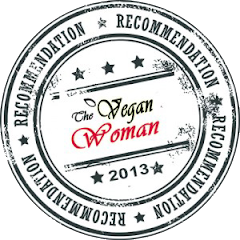 Vegan and gluten free, filled with fruit, and even an optional nut for those who can have them. 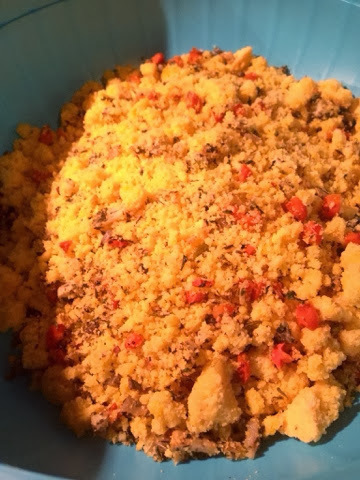 A easy stuffing that can be made ahead of time for the big holiday meal, serve it along side your other favorites and even a yummy midnight snack...we all do it, we just don't talk about it. Its our little secret, but if you get caught sneaking it, your on your own. Enjoy! Grease a baking sheet with olive oil over. 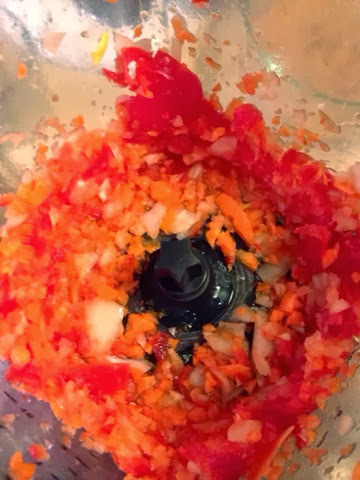 Add onions, carrot, and celery. Add salt and pepper, to taste. Mix in apples, thyme and sage and toss to combine. 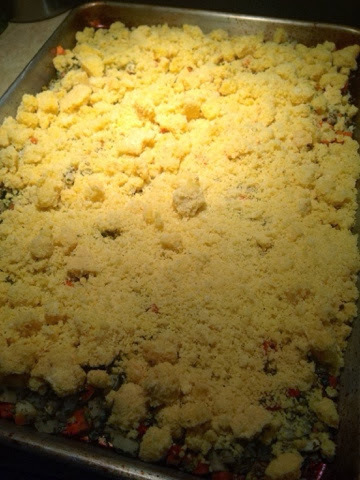 While the veggie mixture cooks, Combine cornbread crumbs in a large bowl. 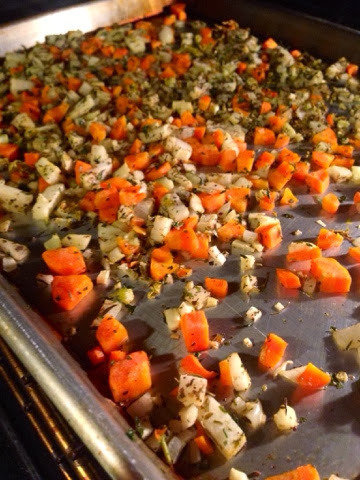 Once the veggies have cooked down for 15 to 20 minutes, remove the sheet pan from the oven and add on the bread crumbs. Add back to the oven for another 15 to 20 minutes until slightly toasted. Remove from the oven and toss the whole pan into a large bowl. Add vegan stock and pecans (optional). 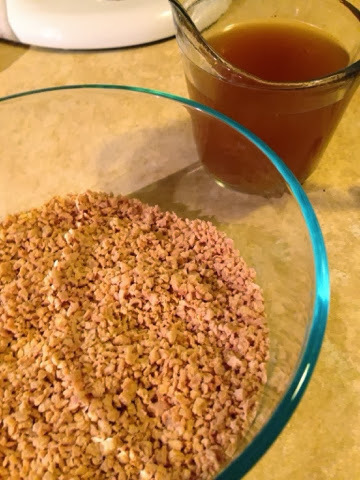 Combine and stir well together. Add to a large casserole dish or individual ramekins and bake for 30 minutes. Once the stuffing has baked, the top is golden brown, and fragrant, remove from the oven and let rest until ready to serve. Serve along side your main dish and store leftovers (if there are any) in the fridge. Enjoy! 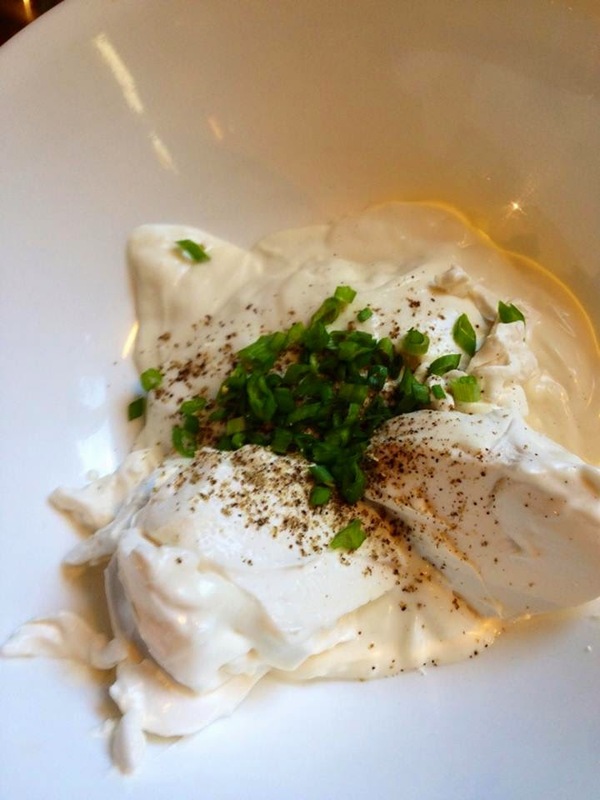 Are you looking for a holiday appetizer? A quick dinner? or a perfect light lunch? Look no further! 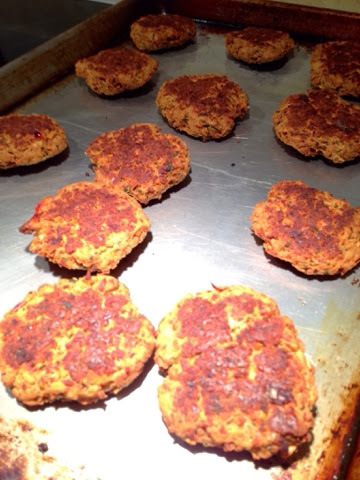 Crab cakes can fill those desired tasks, but vegan crab cakes do that even better. Do I sound like a car salesman yet...maybe a little? But I can guarantee (in my best salesman voice) that these crab cakes will have you baffled with how delish and spot on they really are. 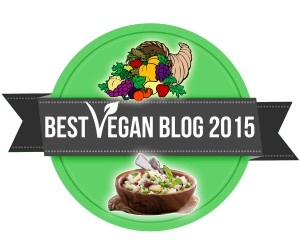 This recipe shows you how to make a perfect vegan crab cake. With the perfect flavor, texture, and crisp outer crunch. 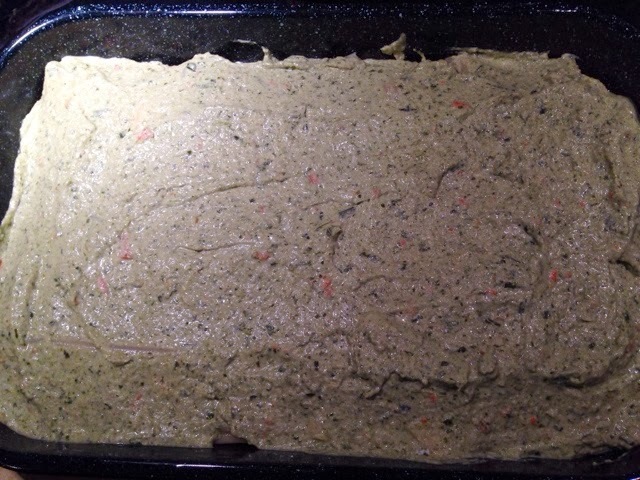 A traditional favorite that can be made for holidays and/or special occasions and even a great quick late night meal. Makes enough for freezing and later heat and enjoy meals on the go. 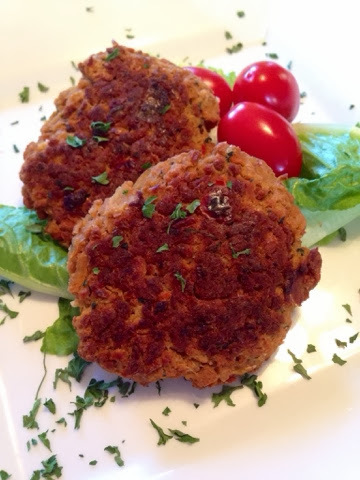 Serve with your favorite sauce (The Comforting Vegan tartar sauce link below) and a nice garden salad. Pairs nicely with vegan white wine and finish it off with a smile. Enjoy! Liberally grease a cookie sheet and set aside. 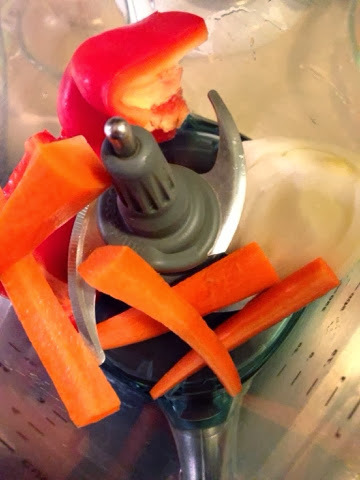 In a food processor, add in your chunked carrot, onion, and red bell pepper. 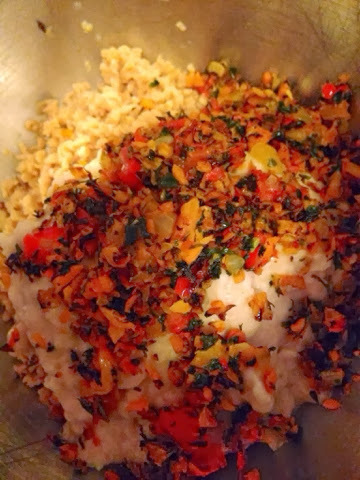 Process until the veggies have been minced coarsely. 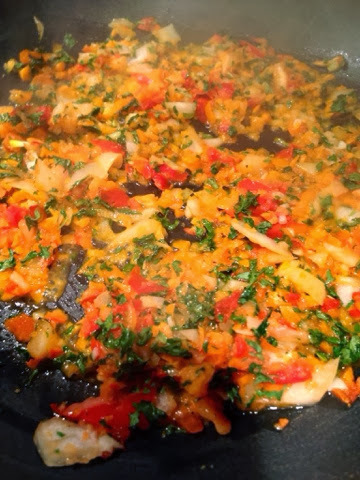 In a medium saute pan, add a couple teaspoons of oil and add in processed veggies, garlic salt, and parsley. Salt and pepper the veggies to taste. 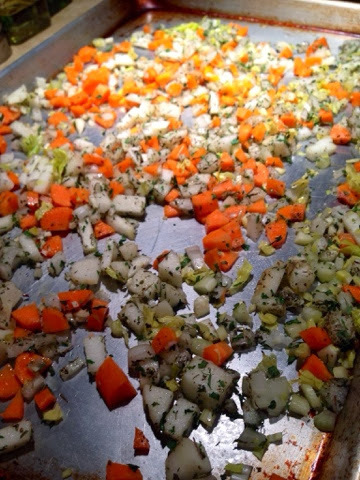 Cook until the mixture of veggies have softened and the onions are translucent. 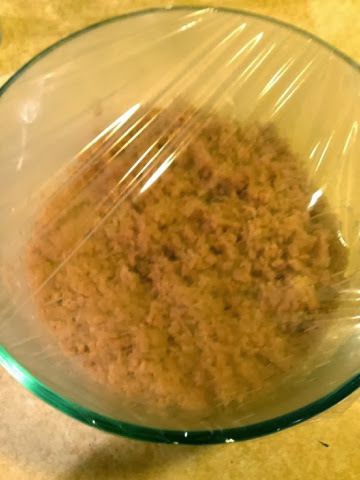 Place your TVP in a bowl, add in hot stock and cover with plastic wrap to soften. In a seperate bowl while the TVP sets. 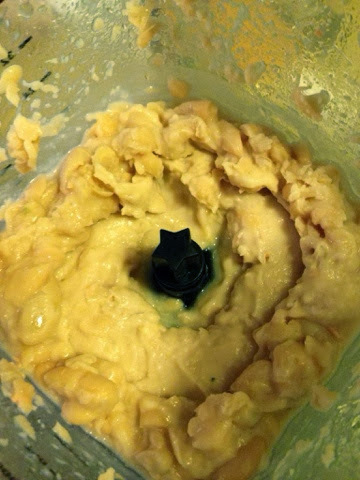 Mash white beans with a potato masher or food processor until coarse. Don't overly mash them, you don't want them pureed. Once the beans are mashed, add in the softened TVP crumbles, vital wheat gluten, seasonings, sauteed veggies, and salt/black pepper to taste. 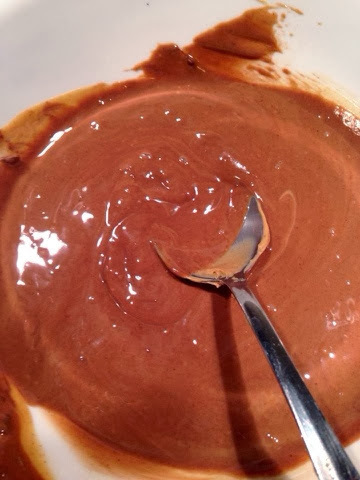 Mix in stand mixer until combined and elastic. 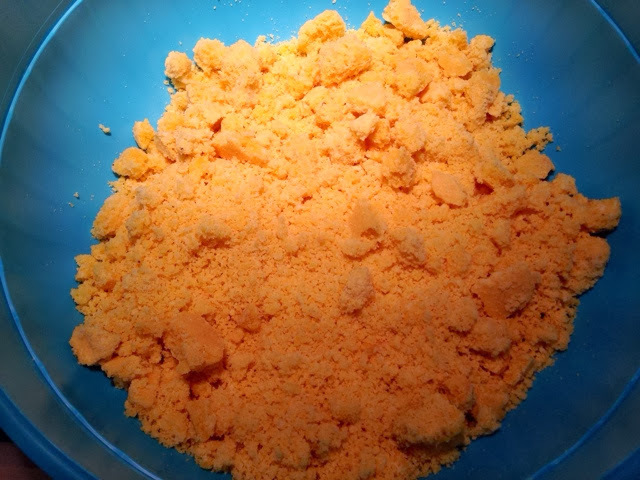 You will see the dough forming more and making gluten strands in the dough. This is the prefers texture. You can use this right away or chill in the fridge until ready to use. 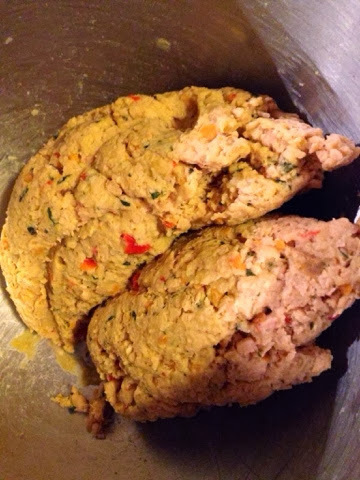 Take the ready to use dough and roll 2 Tbsps of dough into a pattie form. Repeat until all the crab cake patties are done. Place them on the prepared cookie sheet. Bake nuggets for 20 to 30 minutes, making sure to flip half way threw baking. You want the crab cakes to be firm to the touch, crispy, and golden brown. 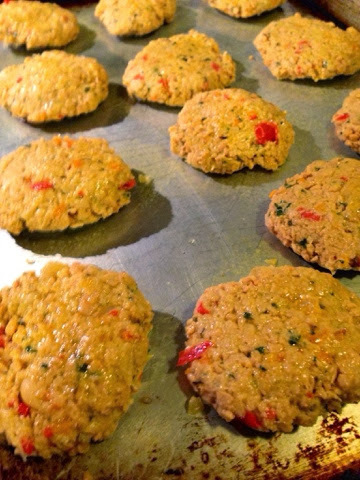 Once they are baked completely, remove from the oven and let cool until ready to serve. Serve along favorite sides and homemade tartar sauce. 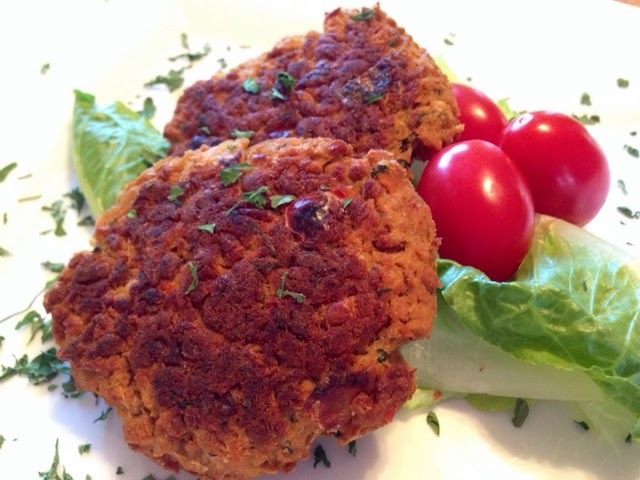 The vegan crab cakes can also be frozen and reheated when desired again and again. Enjoy! Whether you have been working out in the cold all day, shopping for those deals, or playing with the family, hot chocolate is always there. We love to warm up and be comforted at the end of the day, we like to feel snuggley and warmed up in these cold months. Whether you only enjoy it from time to time or love to make it regularly for your family, we want it to be the best hot chocolate we have ever had. 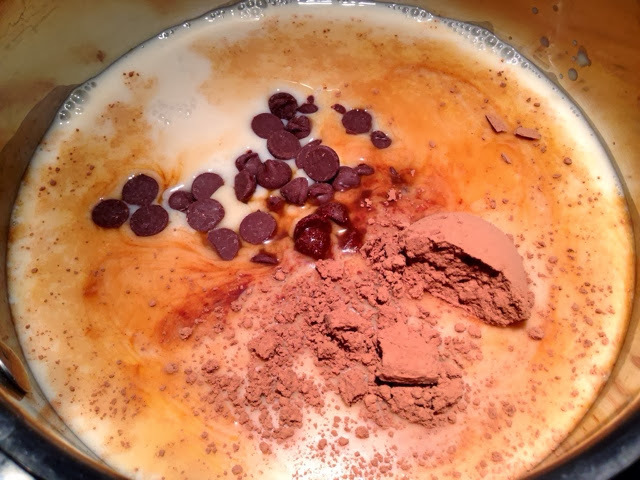 This recipe shows you how to make a sinfully good vegan hot chocolate. 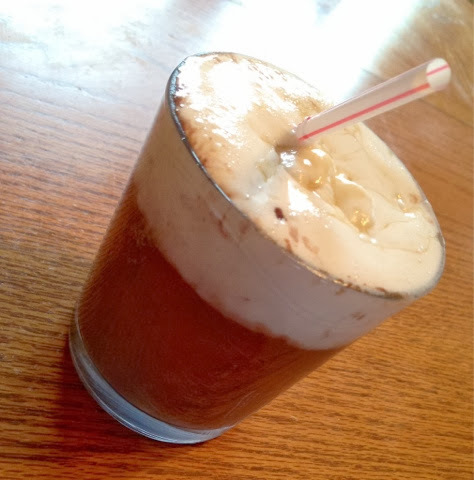 That traditional and perfect cold weather indulgent drink that warms our soul and acts like a big hug. 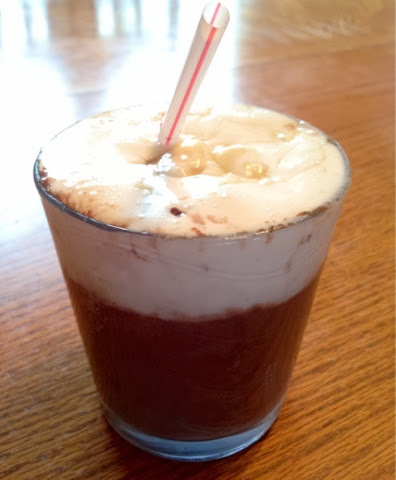 We always remember enjoying it growing up but not everyone had homemade. I can remember the packet store brand kind, those tiny dried marshmallows, and not so homey taste. It may be a quick fix, but this recipe is just as fast and way better. 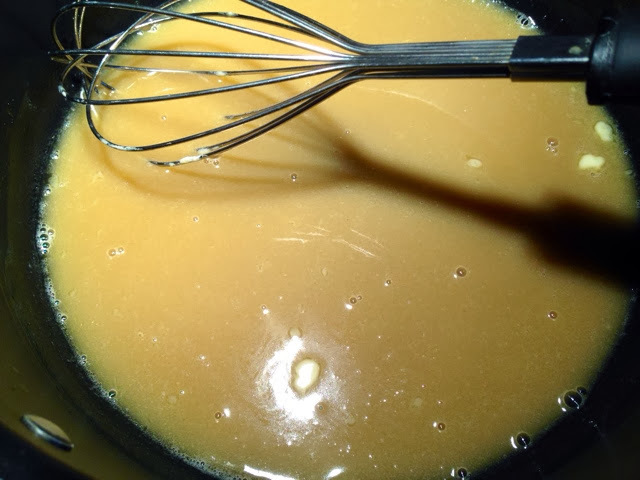 Sure to warm you up and when you serve it to your family assembled and drizzled with that finishing caramel touch, you are sure to feel happy and comforted. Enjoy! 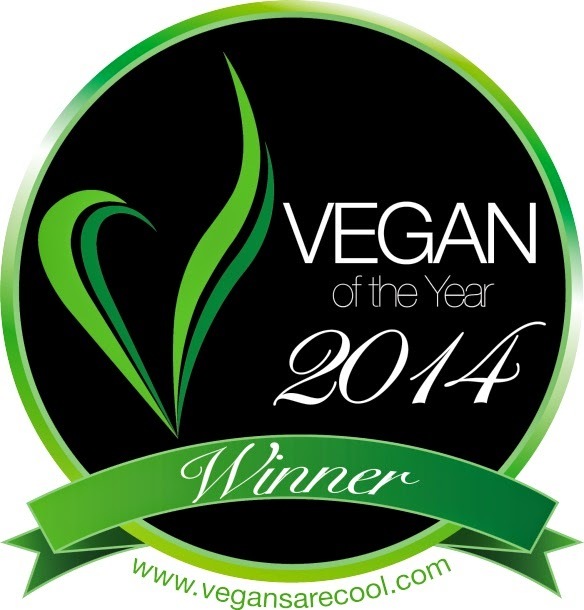 Begin by heating your vegan milks. 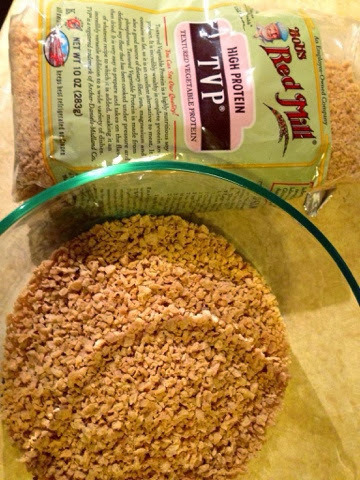 Slowly add in your vegan chocolate and cocoa powder. Whisk until incorporated. You will have to do this in stages, you want it to melt completely and slow. Once the vegan chocolate has been incorporated, add in your vanilla and pinch of salt. Once combined, set aside to make your vegan whipped cream before assembly. Add everything but vanilla in a medium sauce pan. 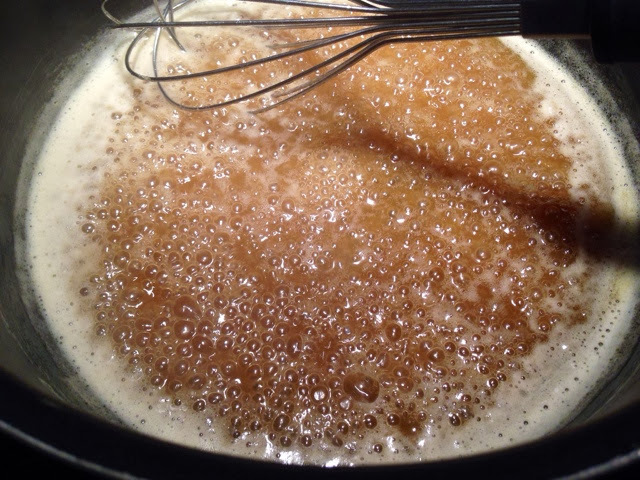 Cook everything over medium heat for about 5-10 minutes whisk until the entire mixture gets thicker. 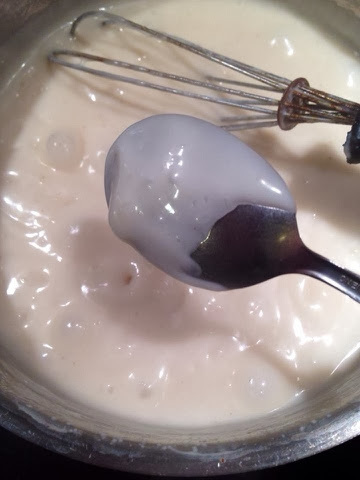 Turn off the heat and whisk in your vanilla. The mixture will bubble and foam, be careful. Cool, pour into a container and refrigerate until ready to use. 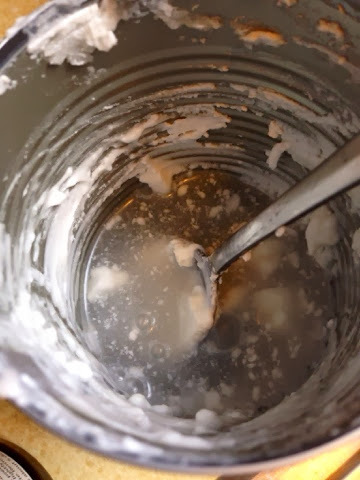 The night before, take a can of full fat coconut milk and place into the fridge to chill. You want to seperate the water and the thick cream of the coconut. This happens over night. When you open, drain out the coconut water and scoop out the thick white cream. 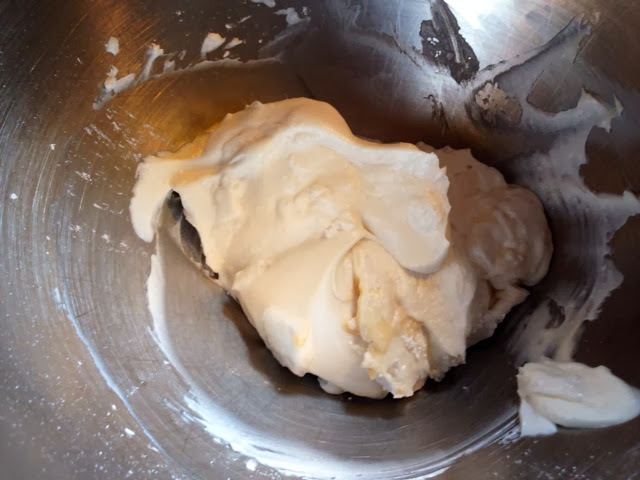 Add all your components into a stand mixer (hand mixer works well too) and whisk to beat the coconut cream. Sprinkle in your 1 to 2 Tbsps sugar and vanilla and continue beating. The entire thing should come together within a few minutes. Taste for sweetness and adjust as desired. In your favorite glass of mug, ladle in your now ready and waiting hot chocolate, followed by a few dollops of made vegan whipped cream. 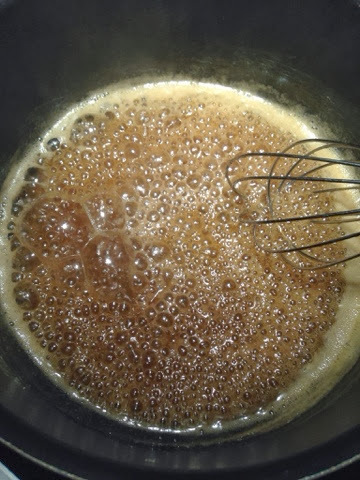 Finish the whole thing off by adding a drizzle if the ready made vegan salted caramel sauce and serve hot and ready to drink. Enjoy! It's that time of year when desserts surround us and we are tempted by all the sugary sweets. But on the down side most houses won't have many vegan, gluten free, or both on the holiday dessert list. Whether you are looking for one or the other, you just want the dessert to be delish and craveable. This recipe shows you how to take the classic combos of PB, chocolate, and banana and turn it into a completely comforting and sweet treat to put on your holiday table. Whether this pie is special for a loved one, your family, or brought to a party, you will not have anyone second guessing their second piece. Serve the pie fresh out of the fridge in equal portions along side your holiday beverage and watch company lick their plates clean. Enjoy! 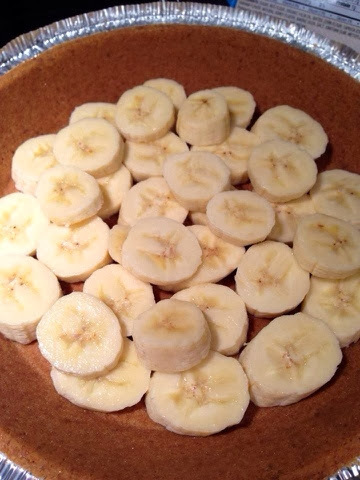 Mix crumbs and vegan butter until well blended, then press into the bottom and sides of a 9-inch pie plate. Bake 5 to 8 min. or until golden brown. Cool completely. While the crust is cooling, make the chocolate layer. 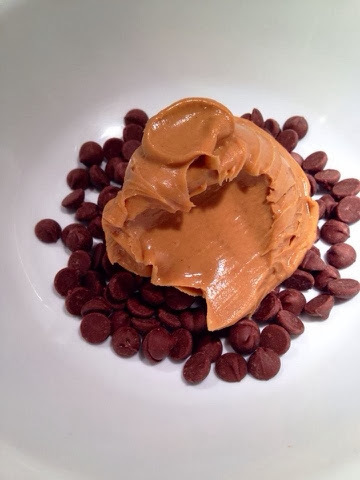 Microwave the vegan chocolate and peanut butter in microwaveable bowl on HIGH for 1 minutes. 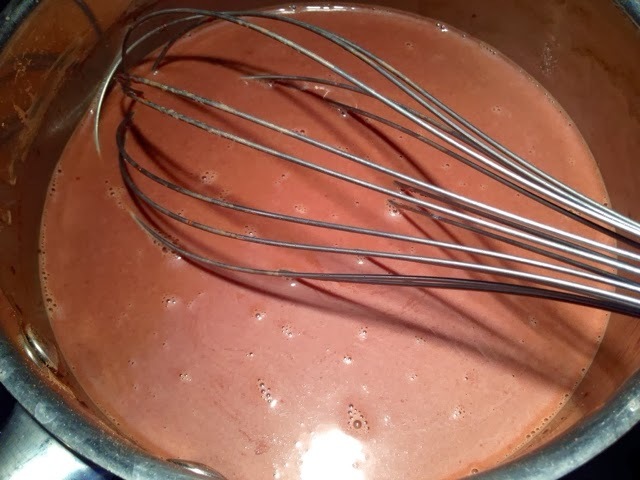 Once the time is up, stir until chocolate is completely melted and mixture is well blended. 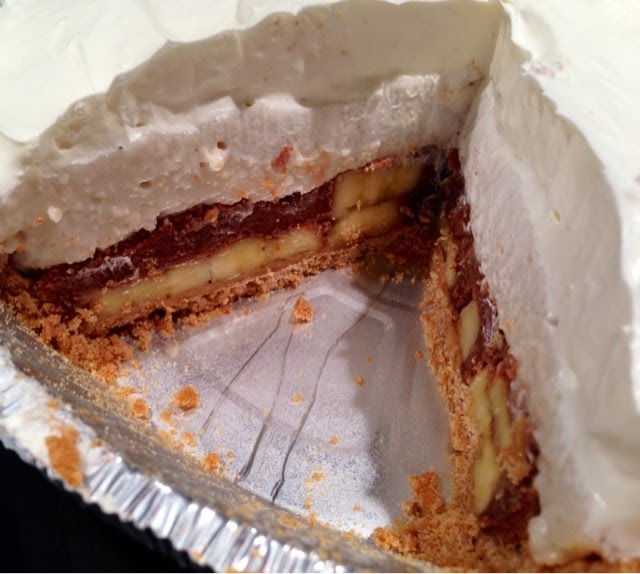 Place your slices bananas on your now cooled crust. 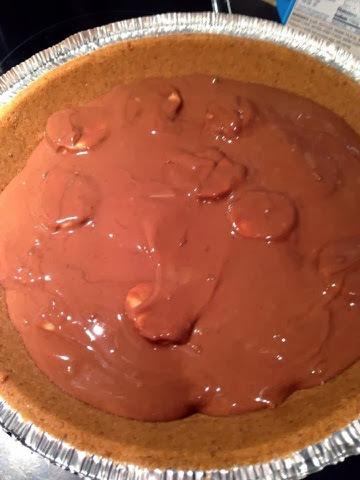 Drizzle with melted chocolate/PB mixture over top. 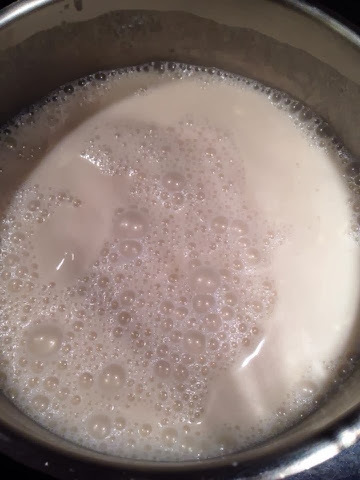 In a medium saucepan, heat up your vegan milk and sugar mixture until boiling. 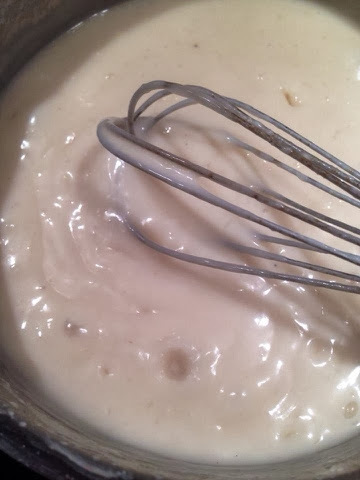 Once your mixture has boiled, add in your vanilla and cornstarch slurry (4 Tbsp cornstarch & 1/4 cup cold water). 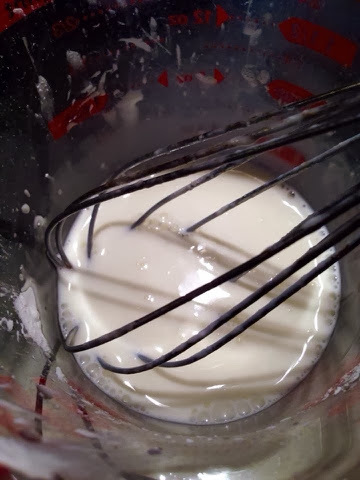 Add the cornstarch slurry to the boiling vegan milk and whisk to combine. You will see it thicken quickly. 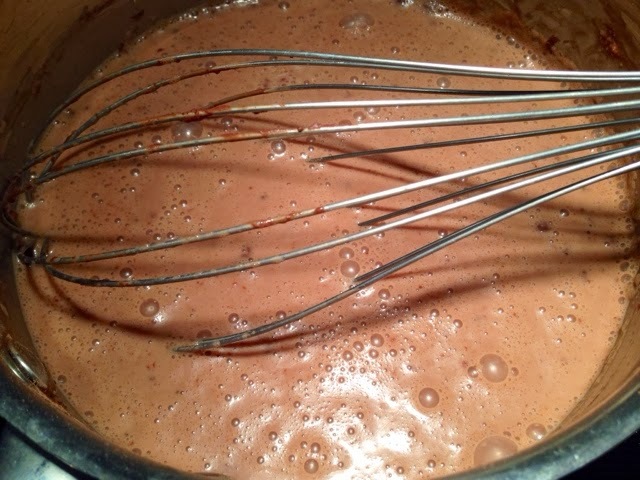 *You want the pudding to coat the back of a spoon, it will get thicker after it cools completely. 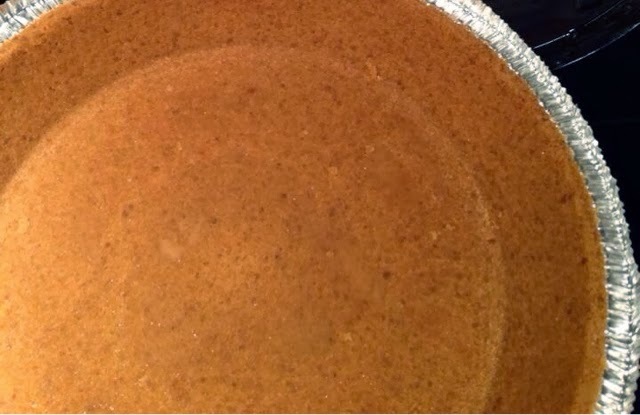 Remove this now hot pudding from the burner and pour on top of the chocolate layer in the pie. Place in the fridge to cool completely. 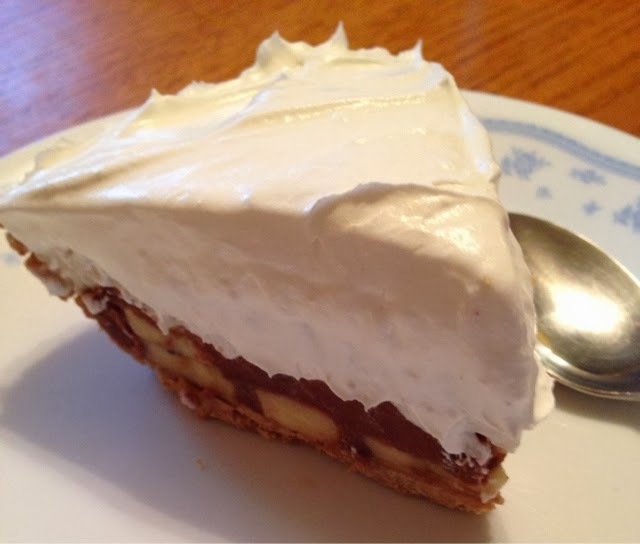 When the pie sets and cools, you will be able to remove it from the fridge and top with vegan whipped cream and add the optional vegan chocolate shavings and nuts for decoration just before serving. Cut and serve equal portions of the pie with your favorite holiday beverage. Enjoy! 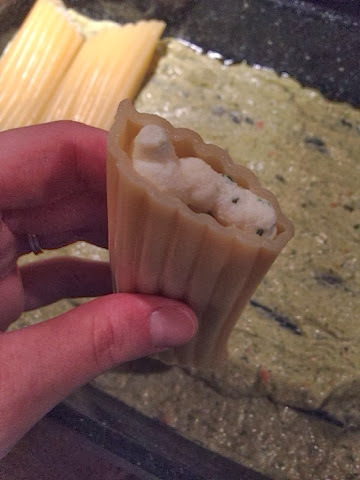 We all crave pasta, all shapes and sizes. But it's fun to change it up from time to time, you can't just have the same old all the time. Changing up something as simple as the sauce can give you a whole new experience, spinach & artichoke is a classic recipe. So why not combine the two? 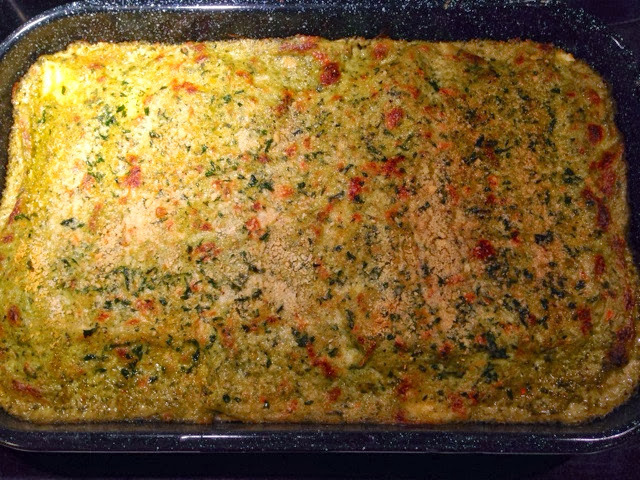 This recipe shows you how to combine the familiar flavors of spinach & artichoke, with the classic baked pasta. With that creamy and savory flavors you love to dip into and a cheesy pasta, you can't go wrong when indulging in this on your next Sunday dinner. Perfectly paired with your favorite bread and vegan adult beverage. Serve along side a fresh garden salad and get ready for a new dinner tonight. Enjoy! 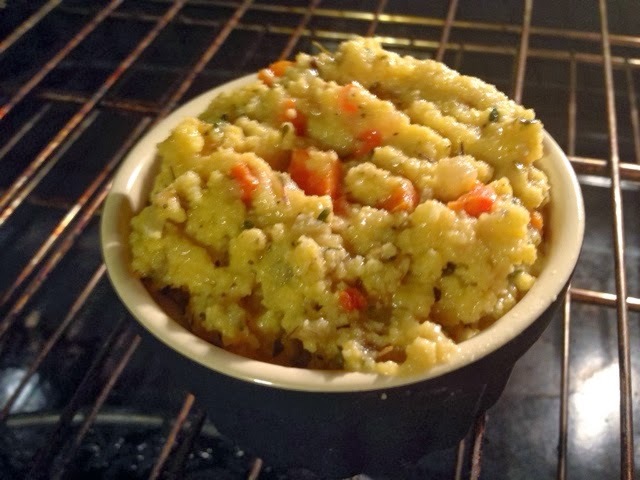 Heat the oven to 375 Degrees and get a casserole or baking dish ready. In a bowl combine vegan mayo, vegan cream cheese, and scallions in a large mixing bowl. 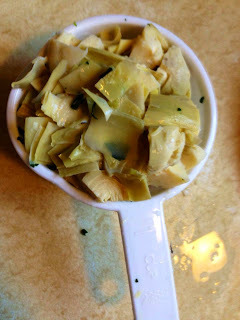 On a cutting board quarter and halve your artichoke hearts and measure 1 cup. On a separate plate, grate chilled Daiya wedges until you get 1 cup. 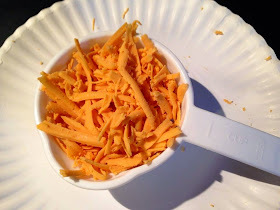 Combine all the rest of the ingredients except the 1/2 cup vegan cheese in a large bowl, you want to have some to go on top. Stir the mixture well to mix everything nicely. *Now if you want this sauce to be smooth, you can purée it in a blender until you reach your desired texture. 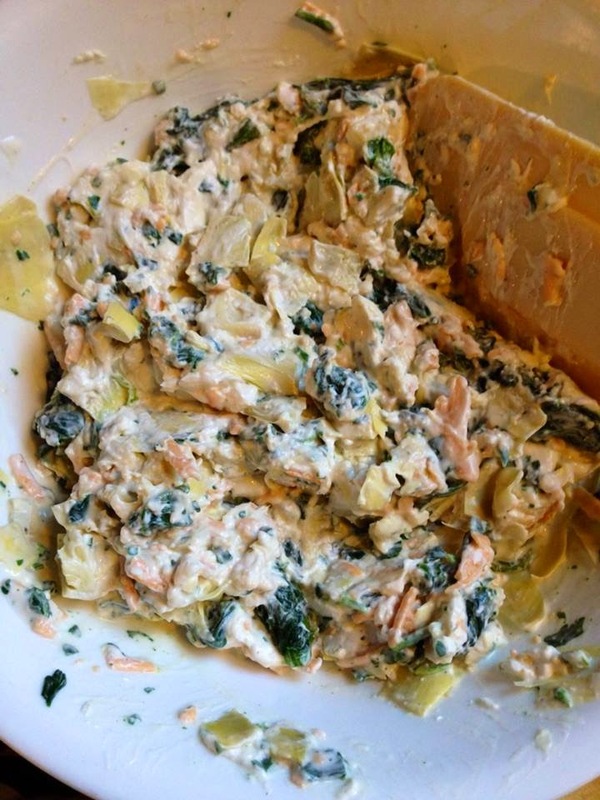 You could also make it chunkier by leaving it as prepared above, both are delish. Once you have you sauce made, set aside in the fridge until ready. Next, prepare your manicotti as directed on the package until al dente. 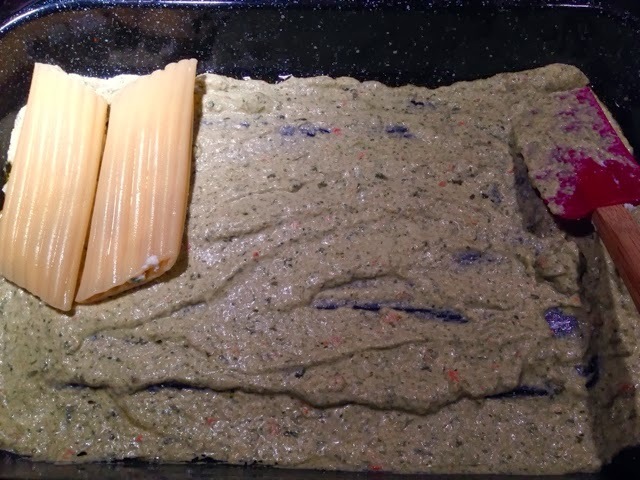 Once at al dente texture, drain the pasta and rinse in cold water. Set aside your shells at this point, prepare your filling by combining all the ingredients and mix. When your shells are drained and rinsed to cool. Pat dry and prepare to fill. 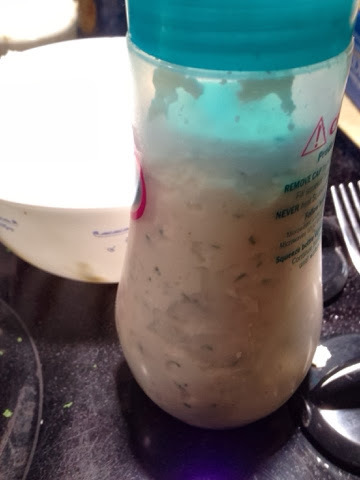 *I used a large opened squeeze bottle but you can use a pastry bag or small spoon to fill. 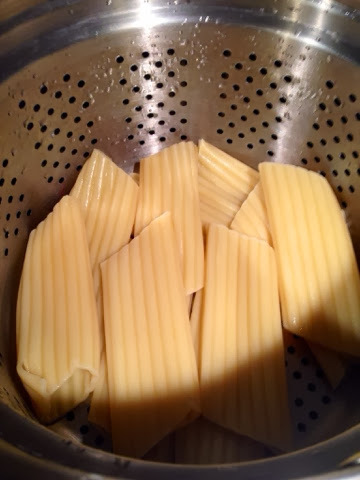 Just remember to be gentle, you don't want to rip the pasta. One by one, take each shell and fill evenly each. 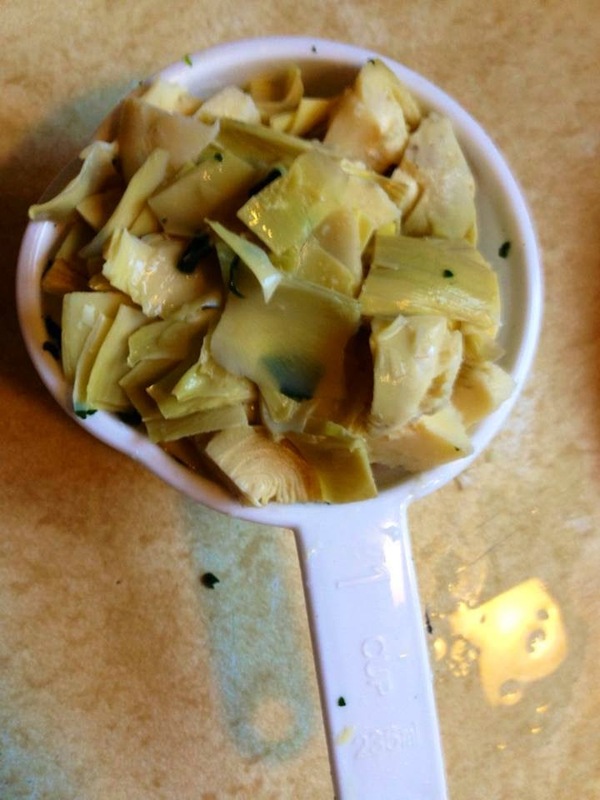 Lay each filled shell in your prepared casserole dish lined with a light layer of your prepared sauce. Repeat this process until all the shells are filled and you have a nicely lined casserole dish. With your remaining sauce, scrape it on top of the prepared casserole dish and sprinkle the topping and a light drizzle of oil to help it brown. 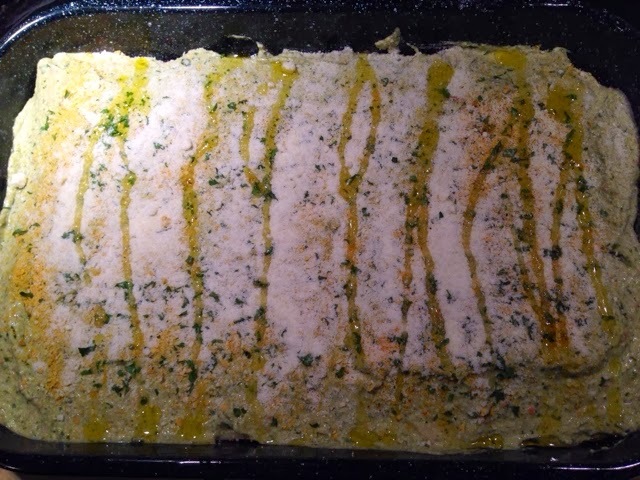 Place in your heated oven and bake for 20 to 30 minutes until bubbly and the topping is lightly browned. Once baked completely, remove from the oven and let sit for 5 to 10 minutes to cool a bit. When ready eat, portion out and serve with a fresh garden salad. Pairs nicely with your favorite bread and vegan adult beverage. Leftovers are great portioned out and frozen for on the go take and reheat meals. Whether you serve it at a party, Sunday dinner, or holiday, this will sure be a treat and change of pace from the boring everyday pasta dish. Enjoy!